Been searching here for a bit and other than cappy(?) using one in the front, I haven't seen if anyone has used/tried the ones on ebay right now. I don't have OE rads to compare to, to know if these have all the correct tabs/mounts etc. for the fans or whatever else to go back to a 2 rad (oe style) setup. Yes, but on dirt bikes, not yet a street or track bike. They say they have a 40mm core (1.575"). Looks like the OE for the SH is 1". Curious if that would even fit under the fairings? edit: the tanks on the OE are just over 1.5"...so...They just might fit? This would be about a 50% total surface area increase, and the aluminum tanks might help with cooling also. edit2: the core of the single rad I have is 10 1/4" x 5 7/8" = 60 square inches of surface. It looks like 1" thick, so 60 cubic inches of cooling surface. These Chinese are 1.5" thick, so that would be 90 cubic. and the aluminum tank might aid in cooling also. Last edited by Spoot; 04-09-2013 at 06:03 PM. Seems to me the volume increase in radiator capacity would require extra coolant, maybe good for keeping the engine cool, but extra weight in fluids... not sure if that's a good thing. Weight? Talk about a non-issue on a piggy of a street bike. a gallon of water weighs 8.33 lbs. It’s not rotation mass on the motor or wheels, it is not unsprung mass that the suspension has to deal with. Adding 4 lbs of sprung mass to a SH is about as inconsequential to “performance” as stopping for lunch along the ride. I think the added weight is worth the extra cooling here in Arizona, and I doubt I'd even notice just street riding. I have a hard time believing these would aid in cooling. Are you tying to increase cooling or just get less expensive units? Why not just ebay stockers? 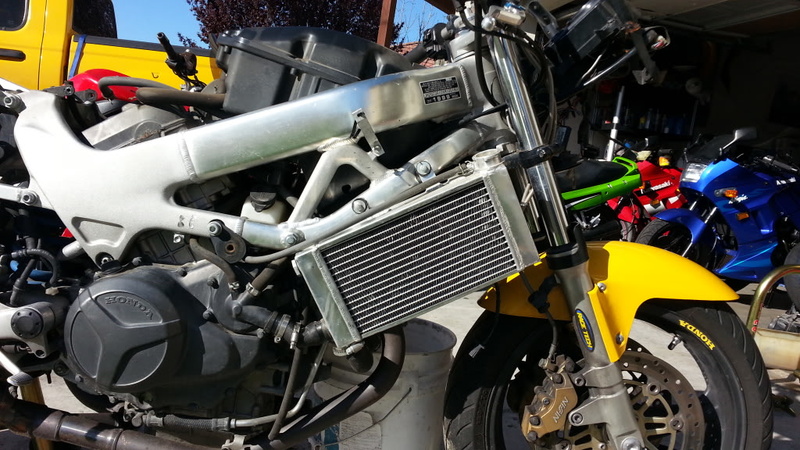 I have Chinese "racing" radiators on my VTR. Mounting brackets were not well located. Fitting took some patience, time and beer. And a bit of grinding away of some of the fairings. Once on they have worked extremely well, no leaks and hardly need the fan unless stuck in traffic around town. I got mine about a year ago off Aliexpress, maybe they have got better since? Yes exactly what I have found as well. In the end you have new radiators, cheaper then you can buy new OEM.. But you have to deal with small mods to make them fit. Never tracked and compared temp data to know if they cool better than serviceable OEM ones, and not tried a pair on the VTR yet.... so take info with that note. But what do you guys mean the switch doesnt fit? Hits the fairings, wrong threads....? The bike that I am parting out came with a larger chinese radiator mounted on the right side, a good stocker on the left side and an unused chinese left in the spare parts box. The bung for the switch was plugged with a bolt on the right side chinese radiator. The left Chinese radiator doesn't have a bung for the switch. I think the switch goes on the oem left rad. So that might be the issue. When I get home tonite I will check and confirm what the actual issue is. IF it's a matter of switch being on the srong side, then just splicing in some wire to extend the sensor leads should solve it. The chinese rads look home/hand made compared to the OEM and is quite a bit larger. Yea wiring is a non issue... if noones claimed those yet how much do you want for them and can you take pictures if you havent already? They radiators have not been claimed. Radiator, aftermarket, pair, undamaged, left side is unused: $70( left and right) + shipping- these are Chinese I believe. The chinese right side mounted on the bike. see the plug in the left upper corner for the temp switch. The switch position is the same on both the stock and the chinese. So the switch incompatibility issue has to be investigated. I will remove the plug from the Chinese rad and see if it fits the stock radiator. If it does fit, then there is no fitment issue. I will hold them for you for a week. no problem. 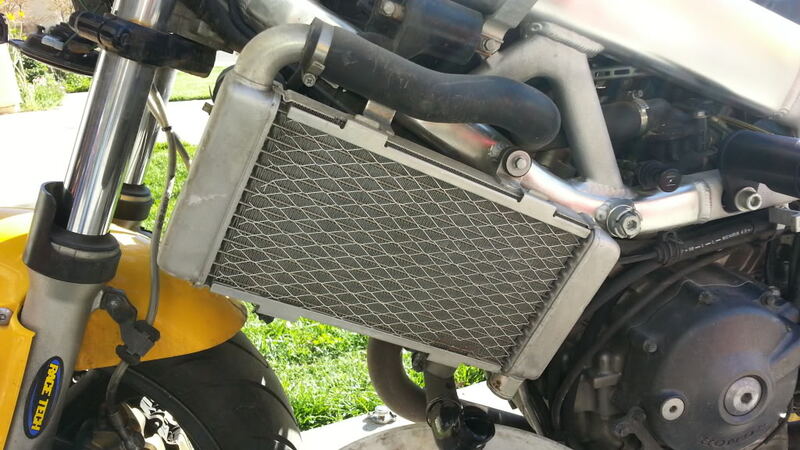 Quick Reply: Anyone use Chinese "racing" radiators from ebay?